Home > NATIONWIDE > EVENT > Don’t miss Doll festivals ’Hinamatsuri’ in March! Don’t miss Doll festivals ’Hinamatsuri’ in March! 3rd March is the girl’s day in Japan so there are many festivals everywhere during March. It’s a good chance to know our annual traditional custom! Don’t miss it ! It has celebrated for girls growing up healthy and happily since Heian period (from 794 to 1185). Once a baby girl is born in a family, parents or grandparents provide a set of Hina doll which is above picture then display it from Febraly to March every year until the girl gets marry. Nowadays, many families don’t have full set of the Hina doll like this picture, instead, majority of families have a Hina doll which is set of top of the steps in this picture. In some festival, old Hina dolls are displayed so you can compare them and know their history. The day and the event are all for girls. However, of coruce we have a boy’s day in May. I will update about it later! I recommended visiting some Hina festivals which are usually organised by local cities and towns. You might find people including children who wear Japanese traditional clothes. They are very beaytifull and their clothes are slightly different to Kimono. We also expected to see peach tree flowers at the same time. The color of flowers is vivit pink and the tree is smaller than cherry brossam one. However it would be good opportunity for overseas visitors who miss cherry brossam season. Enjoy the Hina festivals with peach tree flowers in March ! We have “Hina arare” which is calorful rice crackers for the day. The taste is very soft and simple. 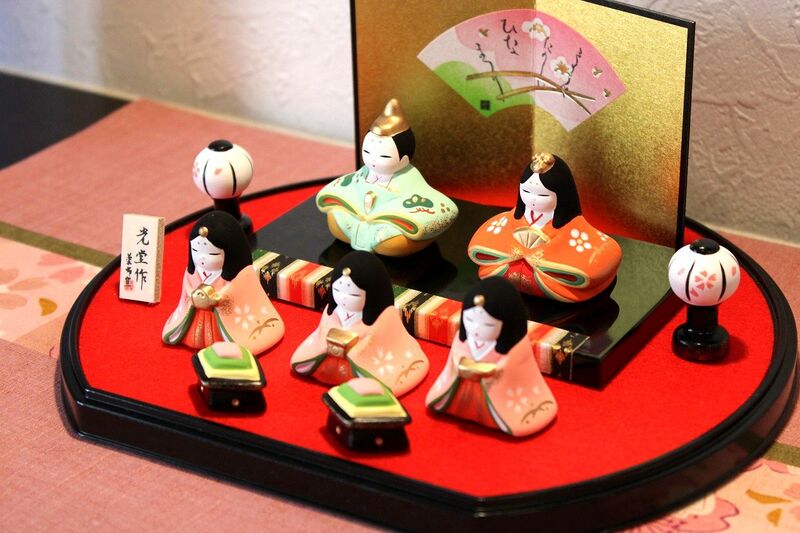 How about a small set of Hina doll for your house or gift if there is a girl/girls in the family ? It would be a good gift because the doll means playing for girls’ health and happiness. What is Golden Week that all Japanese Look Forward to? Japan Joins the Lush Campaign for LGBT Rights Movement !